"By knowing their needs and exceeding their expectations; we enable the success of Florida's Fire and Emergency Services Community!" The Bureau of Firefighter Standards and Training approves Florida's firefighter training curricula, provides training to Florida's emergency services providers at the Florida State Fire College and certifies Florida fire service members to ensure they meet industry-based standards. 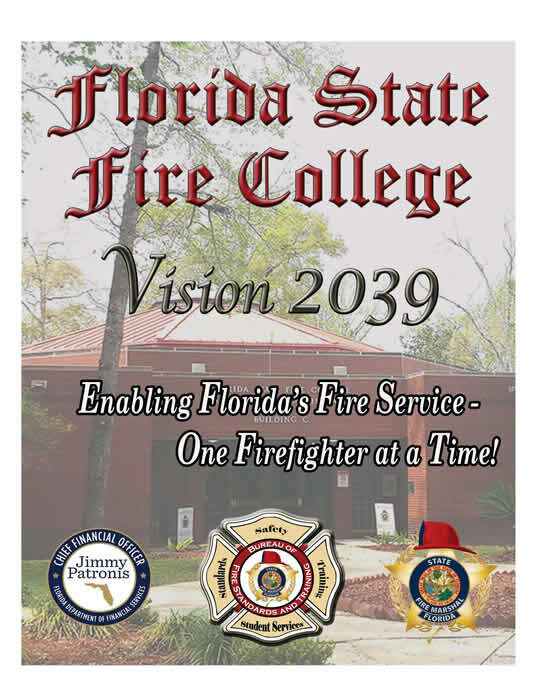 To get a glimpse of where the Fire College is headed; Click on Florida State Fire College Vision 2039! or call us at (352) 369-2800. Where can I access BFST Forms? What process should I follow if I want to sponsor an NFA course? Listing of required books (and their cost) for courses offered at the Florida State Fire College. F L O R I D A S T A T U T E & A D M I N I S T R A T I V E C O D E : 6 3 3 , F . S. & 6 9 A , F . A . C .
Once eligible, how do I enroll in the program? What causes loss of Supplemental Compensation? Does the program have any reporting requirements? Sign-up for the USFA's LAMP Distribution List. Want to pursue a degree program? Contact the FSFC Academic Instructor. T H E A - L I S T : S I G N - U P T O R E C E I V E T H E L A T E S T N E W S F R O M B F S T.
The Bureau of Firefighter Standards and Training is accredited by the National Board on Fire Service Professional Qualifications (ProBoard). Accreditation is the stamp of approval from a third party (Pro Board) review of the Bureau of Firefighter Standards and Training's certification system. The review includes all aspects of certification testing including; completeness, fairness, security, validity and correlation to the National Fire Protection Association (NFPA) standards. Click on the ProBoard Logo for a listing of the accredited Bureau of Firefighter Standards and Training certification programs.